Today, over 42,000 foreign students are studying in the Czech Republic. 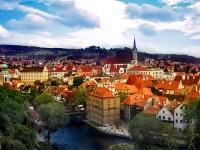 It is a popular destination for international study .The EU statistics in 2014 listed the Czech Republic as the 12th most popular destination for students in Europe. There are many reasons for choosing the Czech Republic as a study destination like as it possess universities with long-standing reputations, unique conception and many specializations, affordable fees and living costs, and a vibrant and colourful cultural life in the heart of Europe. High quality education and research, especially in Sciences, Engineering and Medicines has a place from a long time in Czech Republic.37,000 foreign students are studying at Czech and their interest is growing as the number of study programmes in English is increasing. The costs of living in Czech Republic are not muchhigh so the life is more affordable.In the Czech Republic there are 26 public, 2 state and 42 private educational institutions. Public and private higher education institutions are authorized by Ministry of Education, Youth and Sports and state institutions are authorized by the Ministry of Defence and the Ministry of the Interior.The Erasmus Mundus programme offers scholarships for individuals. Funding is used to attend the joint study programmes at Master and Doctoral level. While studying in the Czech Republic You have several options for arranging accommodation.Some universities provide student dormitories or Student can arrange his own housing in a private flat. International Students have to go to the local Czech embassy to apply for a student visa. Whole procedure requires some paperwork and can take up to 60 days, so it is recommended to apply for the visa in advance.There are short-term visa which are for stays up to 90 days and long-term visa which are for stays over 90 days and these Students can also apply for a long-term residence permit for study purposes. So , Czech Republic which is the Heart of EuropeProvides Quality of education.